I’m about to show you three potent investing trends that are being drowned out by the media noise. Then we’ll uncover three snubbed funds set to ride these surging trends to big gains (hint: one of these buys pays an amazing 8.4% dividend!). Take a close look at the chart below. 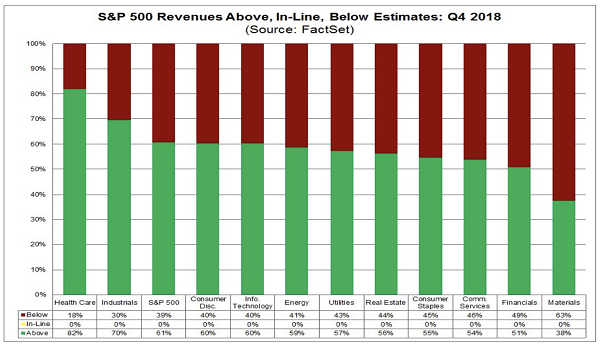 See how every quarter in 2018 has been ahead of every quarter since 2015 by a mile? Here’s the funny thing: despite that, 2018 gave us the first bear market in stocks since 2008. It makes zero sense … and it’s why I’ve been pounding the table on stocks since they started falling last year. With economic growth set to power ahead, albeit at a slower 2.3% rate this year (and bear in mind economists may still be too pessimistic), there’s no reason to fear a recession. Since the Federal Reserve started raising interest rates in 2015, a few people have asked me why it’s raising rates at all. Good question! This has already prompted the Fed to pause rate hikes. 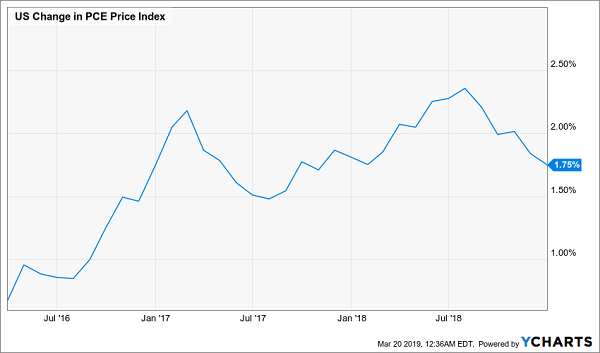 On March 20, it said it likely wouldn’t hike rates in 2019 (with futures markets leaning toward zero hikes in 2020, as well). Since rate hikes could trigger an inverted yield curve, a historic recession predictor, this is a big deal, and it’s one of the reasons why stocks have jumped 12.8% year-to-date. One of the best investing indicators—and a major market driver—is one of the simplest: how much stuff people are buying. The trend is poised to roll on: analysts estimate sales growth of 4.9% in the first quarter of 2019 and 4.7% for all of 2019. Such numbers are something to cheer, not fear. There are three funds you can buy right now to play this strong economy without overpaying. But you’ll have to settle for getting pretty well all your gains on paper: with just a 1.2% dividend yield, or a mere $500 a month on a $500K investment, IWM is not the place for income seekers. Your next alternative is a great fit if you need a mutual fund, say for a 401k: the Vanguard Total Stock Market Index Fund (VTSMX). 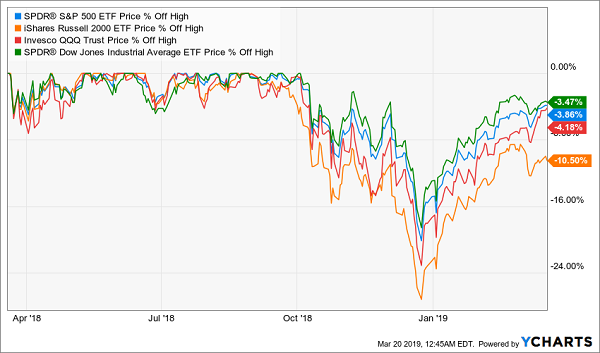 This fund is up 12.8% for 2019 and is much less volatile than IWM, sporting a combination of large-cap, mid-cap and small-cap stocks instead of just leaning on small caps. But like IWM, it’s still well off its 2018 highs, so there’s plenty of upside built in here, too. Too bad it suffers from the same income problem: with just a 1.8% yield, you’re only looking at a $750-a-month “paycheck” on $500K. Finally, let me show you a fund you’ve probably never heard of: the Royce Value Trust (RVT). This is a closed-end fund (CEF) that invests in a massive portfolio (over 300 stocks) of small-cap companies hand-picked by management to outperform. 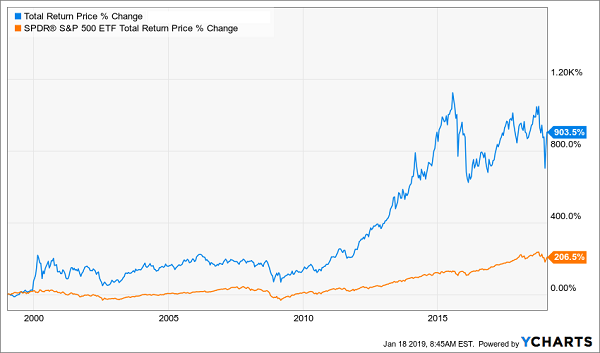 With long-term total returns 69% greater than those of the S&P 500, investors who chose RVT over the benchmark SPDR S&P 500 ETF (SPY) ended up with an extra $19,000 per $10,000 invested over the long haul! And here’s something even more crazy: while RVT trades at less than $14, its portfolio is actually 11.8% more, thanks to the fact that it trades at a discount to its net asset value (NAV), a quirk of most closed-end funds. The best part: the dividend. Right now, RVT yields an incredible 8.5%, so for every $500K you put in, you get $3,540 per month in payouts. That’s a middle-class American salary! And it’s light years ahead of the paltry payouts IWM and VTSMX dribble out. The bottom line? 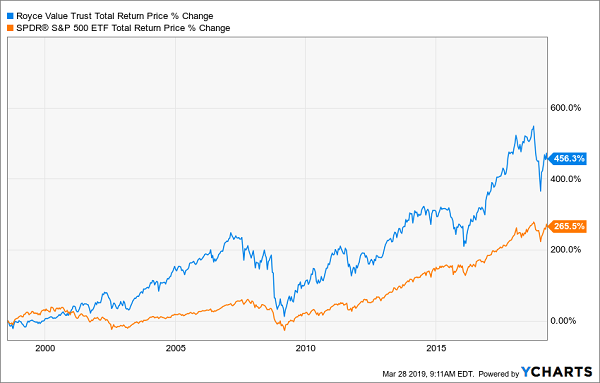 We should be focused on grabbing this king of outperformance, along with a rich income stream, these days—not a market panic that only exists in permabears’ imaginations. CEFs’ discounts to NAV make them hands down the best way to buy stocks. Because these weird markdowns are basically free money! Why would you buy a “regular” stock on an exchange when you could buy through a CEF and get it for 10% to 20% off? It’s a no-brainer! And, just like RVT, there are plenty of CEFs paying safe high single- and double-digit dividends, and some even pay them monthly! Take the 5 other ignored CEFs I recently uncovered (which I’ll reveal when you click right here). They throw off life-changing 8.3% average dividend payouts! This Market-Slayer Is Still Cheap! Plus, this fund throws off an incredible 9.8% dividend! And as I write, this stout income play—which has traded at fat premiums many times in the past—goes for a totally unusual 7% discount. That sets us up for even more “bounce back” upside while we pocket that huge 9.8% payout! The name of this fund and all 5 of these outstanding CEF picks are waiting for you now. All you have to do is click here and I’ll give you full details—names, tickers, buy-under prices and more—on each and every one of them.